He asks, “Daddy what’s wrong? The Power of Prayer is stronger. 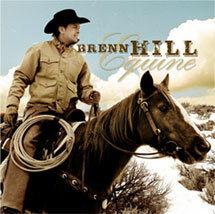 EQUINE is the seventh studio recording from Utah Singer/Songwriter Brenn Hill. Features 16 original songs that in large part focus on the relationship between people and their horses. It includes audience favorites like “Monster On Your Back”, a song written about seventy-plus-year-old cowboy legend Bill Hadlock from Huntsville, Utah, and “Ridin’ Them Colts”, a song about a cowboy’s life-long addiction to colt-breaking. Other live-performance favorites like “Rachel’s Roses”, “Nothin’ In This Life” and “Carter Cedars” commemorate the profound struggle of cancer and the healing power of horses, while “The Ballad of Ed Cantrell” honors the life and career of the controversial lawman from Sweetwater County, Wyoming. The album also features an all-star cast of award-winning musicians such as Larry Beaird, Jonathan Yudkin, JT Corenflos, and Eddie Bayerz. Recorded at Beaird Music Group studios in Nashville, Tennessee, the result is a broad array of musical influences and tastes that create a diverse listening experience for any music lover. The recording comes on the heels of some of the most challenging experiences of Hill’s life and will leave you with good reason to be hopeful for the injured bronc-rider, the cancer-stricken child, or the horses that bring peace to the high and low points of life. It is an inspiring look at the generational nature of equine love, ranching, fatherhood, and the ever-determined western spirit. If you love horses you must have EQUINE. Over the years, horses have been a constant in my life and in the lives of those around me. The life lessons that I have learned from them have shaped me, refined me, and carried me through the hard times. It is a love and passion that I hope to share with my children. What do horses mean to you? I wrote this song for all those thirty-something and older cowboys that grew up on the ranch and that are still out on the roadmakin’ a livin’ on the back of a bronc, bull, or rope-horse. It takes a mighty sacrifice to do what you love for a livin’. This one’s for all of those that still ride for the brand. I wrote this song about Casey Bitton. He’s a father, a cowboy, and a damn good friend. My wife used to worry about all that he was takin’ on in life until I assured her with this song that he’d pull through. Cowboys always do. This one’s a barn burner for sure. Ol’ Cantrell was one tough lawman. Some folks didn’t care too much for him. But he patrolled some wild country through the years of the oil boom. No matter how you feel about Cantrell, you gotta respect the guy. He was a survivor. I wrote this song as a wedding present for Casey and Rachel Bitton. She’s a ten-year-plus cancer survivor and she competed for a National Title when she was in treatment. They live in a hundred-year-old home in Hooper with the prettiest rose bushes you’ve ever seen. She always wanted to live in that house. How could any of us have known in June of 2007 how much meaning this song would have for us all today…? When I saw that little red-roan mare haul over backwards on Chris Hopkins, I was frozen in fear. It was the worst wreck I’d ever witnessed. We all thought we’d lost him. As Little Isaac, who’s not so little anymore, wiped the tears off his dusty face, I realized what it means to inherit the family brand – the awesome responsibility of the land and the cattle. These words came to me as Rick, Casey, Bob, Bruce, and I stayed to push Chris’ heifers up the rest of Heiner Canyon. Bill Montag is one of my best friends. We were punchin’ cows one day at the ranch he used to run over in Steamboat Springswhen he told me about his famous daughter Heidi. I didn’t think anybody could ever be as famous as Bill but he insiststhat his daughter is even more famous than he is. What the heck is ‘reality TV’ anyway? This one was inspired by Chris Redman, colt-breaker, buckaroo, and good friend from Idaho. I’ve always admired how he can do in an afternoon what takes me a month with a colt. He’s got a gift and a good horse is a tool-of-the-trade for a fella that does what he does day-in and day-out. Thanks for the lessons amigo. As I sat by Briggs’ bed during his third round of chemo, I wondered just how much more a little boy could take. He would wake up every now and then to throw up the nothing that was in his stomach and tell the nurses that he and I were going to hunt badgers when he got all better. Watching someone you love go through something like cancer is the hardest thing you’ll ever experience in this life.Briggs has earned his right to a life of good memories and you can bet that we’ll be across the cattle guard as soon as he’s able.